The Rest of the Story. I have to tip my hat to Grand Trunk for trying something new. When I tested this hammock back in 2009, the Hybrid was the first on the market (and I think the only one still) to have a built-in modular design. The Hybrid hammock is unique among gathered end hammocks due to its intended use and design as a hammock, tarp/rain fly, and ground cloth. And while any hammock can be used on the ground as a bivy, the Hybrid is one of the first with an intentional “go-to-ground” design with its waterproof coating and sewn tie-outs along the edges. One of the first questions you might ask is whether the waterproof coating creates a pool of sweat. I never noticed any water collection in the hammock when I tested it, including a trip to Hawaii along the Kalalau Trail. The only thing that really gave me hives was testing the hammock as a ground cloth. I think where this hammock really fits a niche is for ultralight backpackers who want a versatile, modular shelter option. Using the hammock as your primary ground shelter (tarp/mid) above the tree line (or for the entire trip), and using the hammock during clear nights or just to relax along the trail. I would consider the Grand Trunk All Terrain Hybrid Hammock the first “bivy hammock” thanks to its modular design. You’re right. 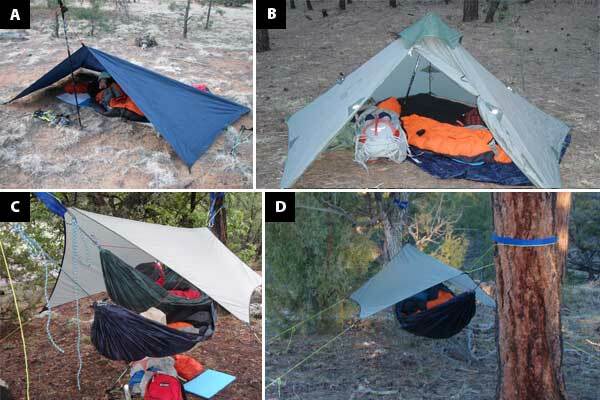 The DD Hammock line has a modular set-up built in as well. Thanks for the reminder! I really need to get my hands on a DD Hammock. I keep hearing great things about them, but I just need to try them out. Thanks for the update. Would this be able to be set up with doors? Like a winter hammock tarp? You could turn in the edges to create make shift doors.